Ancient Rome remained the most glorious empire of the world for several centuries. However, like the fall other great civilisations, eventually the demise of Rome also took place. However, the demise of Rome was not a sudden process but a very long one spanning centuries. Historians and scholars have since debated about the causes behind the demise of the ancient Roman Empire. Various reasons can be put forward as playing their role in the decline and fall of the Roman Empire. 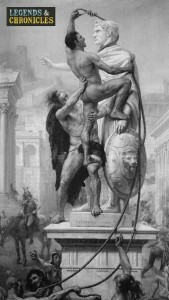 The actual decline of the Roman Empire could be said to have been triggered after 190 AD when a combination of various factors such as corrupt rulers, economic inefficiency, and barbarian invasions began to disrupt the fabric of the empire. From the 3rd century AD onwards, the size of various fortifications built to protect the empire from barbarian invasions also began to decline. Also from the same time, the strong centralisation of Rome began to wane and various other cities began to be used for administrative purposes. Eventually, the eastern city of Constantinople became more powerful and larger than Rome itself. Some important reasons for the fall and decline of the Roman Empire are discussed below. Romans moving after the demise of ancient Rome. One of the most important reasons for the demise of the vast Roman Empire was the invasions of the barbarian tribes from the North. Rome was constantly at odds with these tribes throughout its existence but the threat became severe with the increasing migrations and invasions of these tribes after 200 AD. Larger tribes such as Goths began encroaching beyond the borders of the empire in third century AD. They were followed by various Germanic invasions and uprising and eventually the city of Rome was sacked by the Visigoth King Alaric in 410 AD. The city was then again raided by the Vandals in 455 AD and the demise of the Roman Empire became final when in 476 the Germanic leader Odoacer deposed the Roman Emperor Romulus Augustulus. 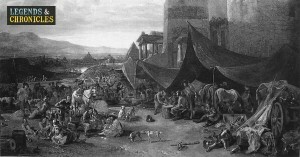 Economic troubles of Rome are often cited as central to the demise of the ancient Rome. Rome was constantly at war with other empires and states and this had a huge strain on the economy of the empire. Oppressive taxation and rising inflation led to the increasing disparity between the rich and the poor and therefore the loyalty and attitude from the masses of Roman people began to change. Dependence on slave labour for tilling of land was another blow to the economy and because of the halt in the expansion of the empire there weren’t any more slaves to till the land. The Empire’s trade was further disrupted by the invading barbarian tribes. The division of the Roman Empire by Emperor Diocletian into eastern and western empires weakened the fabric of the empire and contributed to the demise of ancient Rome. The Eastern Empire, known as Byzantium, had its capital at Constantinople which constantly grew in importance and economic worth. Rifts between eastern and western parts of the empire led to the weakening of both parts particularly the western part which was already facing constant invasions from the barbarian tribes. Since the eastern part became more powerful, this left the western part more vulnerable to attack and this also led to the demise of the empire. The goths invading the centre of Rome. The Roman Empire was stretched from Britain in the West to Jerusalem and Syria in the East, including Western Europe, the Mediterranean region, and North Africa. Extreme administrative efficiency and military power was needed to sustain this vast empire. With the passage of time, more and more military spending led to less civilian development and this created a variety of problems in the society itself. Additionally, to augment the military spending, increasing taxes were levied which created discontent in the population. A major reason for the demise of ancient Rome and all ancient civilisations was increasing corruption at the highest levels of the government as well as political instability. During the second and third centuries, Roman politics was in chaos and within a span of 75 years, 20 emperors came and went. Further, there was increasing rift between the emperors and the senators which added to the political instability. The excesses of the emperors increased and they wanted to concentrate all the power in their own hands. This political instability was to stay with Rome and continue heavily to its eventual downfall and demise. The rise of Christianity in the Roman Empire has often been cited as one of the factors that contributed to the demise of ancient Rome. Christianity was adopted as the official religion of the empire in 380 AD and this resulted in eroding away the traditional values of ancient Rome. Increasing role of popes and religious leaders complicated the situation further since they were not much interested in efficiently running the affairs of the state but only consolidating Christianity throughout the Empire and beyond. But most scholars consider this a lesser factor compared to more important factors of the decline in the military and economy. The composition of the Roman military changed over the course of centuries that it ruled. The Roman army was once the most powerful army in the world and was considered virtually unbeatable. However, with the passage of time, it became increasingly difficult to recruit Roman soldiers and emperors such as Diocletian and Constantine began to rely on mercenary armies for their military purposes. Many of these mercenary warriors came from the barbarian tribes and while they were very effective warriors, they did not have any loyalty to the Roman empire and often turned against the empire itself. Ancient Rome was a vast empire that stretched over three continents and governed over three quarters of the population of the world. Under the Republic and Empire, for a long time Rome was governed in a very efficient way but starting from around 200 AD, the decline of Rome began for which several factors were responsible. Some important ones of these factors included political corruption and instability, too much reliance on slave economy, disruption of trade by barbarian invasions, the invasions of Germanic tribes, rise of Christianity, and the split of the vast empire into eastern and western parts often at odds with each other. These factors eventually led to the final demise of ancient Rome which was once the most glorious empire in the world.